The Australian dollar spiked higher overnight as the greenback swooned and the local currency may have enough upward momentum to carry it to US78¢, according to ANZ. It didn’t hurt that iron ore continued to edge higher too, retaking the $US80 a tonne level. Still the focus was on President-elect Donald Trump who disappointed investors by not specifically highlighting his pro-growth agenda during his first news conference since winning the November 8 election. The news conference focused primarily on Mr Trump’s plans for his businesses and on this week’s reports of Russian efforts to influence the election, whether Russian intelligence has compromising information on Mr Trump and potential links between Russia and Mr Trump. With no fresh rationale for buying the US dollar, investors sold. The yield on the 10-year US government bond dropped sharply before closing little changed. The US sold $US20 billion of 10-year bonds overnight. “The AUD looks set to continue to test the topside after surging ahead overnight,” ANZ economists wrote. “We expect that the AUD could re-test 0.78 given it has lagged fundamentals.” The Aussie last traded above US78¢ in April. Westpac said it sees US75.25¢ as the next target for the Aussie. The Australian dollar shot as high as US74.72¢ overnight, during Mr Trump’s news conference, reaching its highest since mid December. At about 8.45am AEDT, the local currency was up 1 per cent at US74.44¢. The local dollar continues to outperform other major currencies against the greenback this year, NAB currency strategist Rodrigo Catril said, reflecting in part a decline in concern over the instability of China’s yuan. Catril also said gains in gold and iron ore have more than offset softer coal prices. Other currencies which advanced overnight included the New Zealand dollar and sterling. 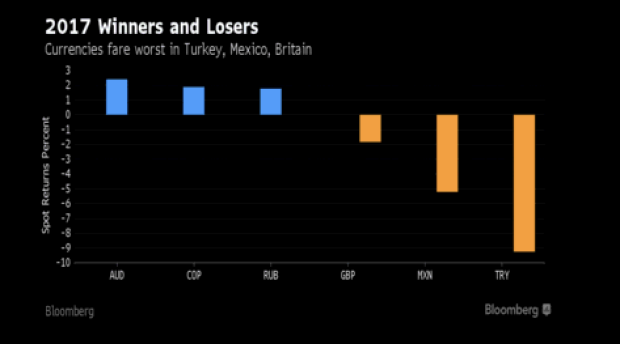 It was rougher session for emerging market currencies in particular Turkey’s lira and Mexico’s peso, both fell to fresh record lows against the greenback. The peso fell to 22.04 per US dollar as Mr Trump affirmed plans to build a wall between the US and Mexico in a bid to check illegal immigration, and to have Mexico pay for it. He also said he was committed to imposing “a very large border tax” on products made by companies which shift production outside the US. The US dollar has rallied in the last month to a 14-year high on bets the incoming Trump administration will cut personal income taxes, ease business regulations as well as boost spending on roads and bridges. Those measure could help accelerate inflation, clearing a path for the Federal Reserve to lift US interest rates at a faster pace. The Fed is tipping three potential rate hikes this year. “The issue is that markets arguably priced in too much reflation without any solid policy detail,” Westpac also said, adding that the January 20 inauguration speech is sure to contain “clear references to his pro-growth agenda for the US economy but otherwise markets need to approach future unscripted Trump events with a more balanced perspective”.